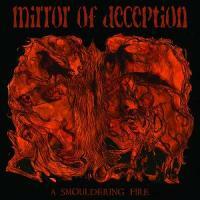 MIRROR OF DECEPTION belong to that category where you have to give their albums a couple of spins to get into the climate that these German doomsters create. After the unknown “Mirrorsoil” to many doom fans around the globe, the highlighted “Foregone” and the excellent “Shards”, which was the top album of their carrier in my opinion, MIRRORS are back, 4 years later, celebrating their 20th anniversary with the 4th studio release, entitled “A Smouldering Fire”. The band shows where it stands after 20 years of creation and dedication to the genre we love; epic/ melodic doom Metal. Our misty and epic doom-y journey through the 57 minutes of the CD begins with the NWOBHM-esque “Isle Of Horror” and the driving riff and the monolithic drums making this track an ideal album opener. “Heroes Of The Atom Age” is a short instrumental track, featuring an eerie scent from COUNT RAVEN’s releases with the bass being the main leader, while the next “Bellwethers In Mist” carries the onerous burden of the Michael Siffermann’s lyrical vocals which remind me a lot the reading of Roibéard Ó Bogail (MAEL MORDHA). My very favourite song though is the penultimate “The Flood And The Horses” where the guitars seem to be closely to my beloved REVEREND BIZARRE sound and that damn haunted quaver. So far, so good, you are probably thinking, but I can not agree with you. What does happen with the rest of the album? Well, the things here are a little bit messed up; a couple of MY DYING BRIDE-esque melodies can be found in tracks like “The Riven Tree”, the well-polished “Unforeseen” and the closing “Voyage Obscure”, while some KATATONIA-esque guitars rule upon “Walking Through The Clouds”; the rest of the album including “Lauernder Schmerz”, “Leguano” and “Sojourner” are the most indifferent moments of MIRROR OF DECEPTION’s music route. As a special gift for the 20th anniversary of the band, the fans will also fin a bonus CD, entitled “The First 2 Decades” with lots of rarities, cover tunes and songs only available on vinyl before, as well as 3 newly recorded demo songs that unfortunately were not included in the promo stuff I got in my hands. So, it’s your call if you are going to cross the threshold of MIRROR OF DECEMPTION this time. On a second thought, having “The Flood And The Horses” in the contents of this one, I think I’m going to stay.